Critterkiller I'm going to hang onto the SSA unless the upper sells for now. Trying to sell the upper & case of ammo as one for $1150 shipped conus. If you're interested I can forward you links to the build parts, I have about $940 into the upper and about 80 through the tube. I don't WANT to get out of the 6.8, I have to.... stupid no contact order is forcing me to turn in all weapons even though it had nothing at all to do with weapons. I have one full unopened case (500 rounds) of Federal XM68GD ammo for sale. This is a 90 grain Gold Dot bonded bullet and on top of 6.8 ammo being difficult to find/expensive this particular round is extra tough to get a hold of. I'm asking $500 + 1/2 of actual shipping cost via UPS ground, which is a pretty good deal. I also have 200 loose rounds of the same ammo, 20 SSA 110gr Accubounds, 20 SSA 85gr TSX rounds and lots of brass. For now I'm not selling in small quantities, I'd like to sell the case & the loose rounds together or the case alone and all the loose rounds alone. I will be selling a basically new 6.8 SPC II upper soon as well built on a Bravo upper, RGUNS bolt carrier, LWRC Advanced Combat Bolt, Daniel Defense barrel (can't remember the specifics of it at the moment but it's their top end 6.8 barrel), 11" Troy Alpha handguard, Bravo Mod 4 charging handle among other smaller parts. I'd also like to sell the upper as one but if enough people want various parts I'd part it out. Let me know if you're interested in anything! dubya replied to dubya's topic in General Discussion - Any topic is welcome here!!! You can find the new 40 round PMAGS everywhere huh? Would you mind sharing some links? No I buy things to use, not sell. You must have been one of those guys that spent $50+/mag three months ago based on your attitude. dubya posted a topic in General Discussion - Any topic is welcome here!!! dubya replied to jerry52's topic in General Discussion - Any topic is welcome here!!! Glocks ALWAYS go bang, are cheap, light and are reliable but.... let's face it, they're like the Ford Focus or Chevy Cobalt of the pistol world. Simple. Reliable, cost effective but every 21 year old has one and while they're good at everything, they're not great at anything IMO. I've owned 11 different Blocks (29,26, 19, 20, FDE 21, 32, FDE 17, three 36's and a 22), I used to love them but after 6 years of buying, shooting and carrying pistols I've come to love the 1911 and pretty much ANY modern FN pistol. Sorry if my post makes no sense, I didn't watch the video, just seen"Block" was mentioned and had to post ! been finding some good ones this year! Thanks guys, its fun to go search for them and anyone can be good at it. It's a lot of fun for the kids too plus you cam make money for free if you find nice ones like above, $20-$100 up to the thousands for one rock! Thats a free gun lol. dubya replied to NM0's topic in General Discussion - Any topic is welcome here!!! The clear ones? If so, yes I've shot a lot of them. They sound different compared to American 00 buck, smell different and feel underpowered compared to normal Federal or Winchester 00 but I sure wouldn't be scared of much with 8 rounds of it in a S12! I'll send you one or two if you PM your address. They won't be my boig ones but something with good character and color to get you a couple MN agates. Every year from Spring-Fall I hunt for Lake Superior Agates, mostly at work (I'm a cement truck driver so I'm around rock all day) but also on the weekends whenever I'm out and about. Anyone else collect or have any "Lakers"? 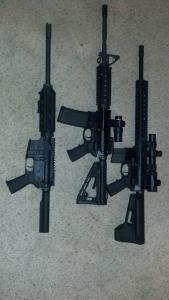 If you're not a collector but have one or a few I'll buy or trade gun stuff for em! Here are a few of the better Lakers I've found this year so far. dubya replied to Tundra1's topic in General Discussion - Any topic is welcome here!!! Tylenol is a teeny problem compared to what I used to put in my body 5-6 years ago. If you're not getting drunk 1+ times a week and popping Tylenol at bed time I highly doubt you'll experience any issues with your liver. No cures here, just a bottle of water and two Tylenol or Advil right before passing out does the trick for up to a 18 pack. If I forgot water & pills before bed (which I usually do) it's drink about 4 more beers in the morning then slowly sip a few more until I'm feeling 110% again. Its yours then, shoot me a PM with your address and I'll do the same.